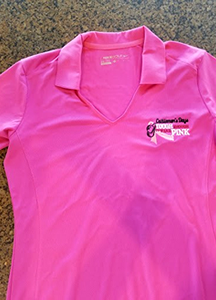 Support Cattlemen’s Days Tough Enough To Wear Pink by buying our terrific items! 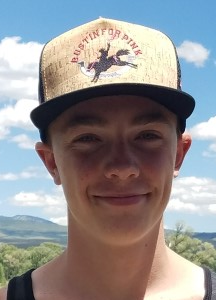 We are working on brand new items for our exciting 2019 line, so please email us or call (970) 209-6332 to purchase or if you have questions about our products. 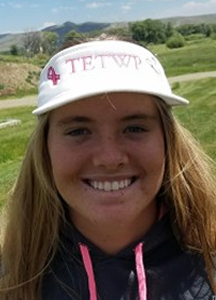 Cute black and pink hat with our TETWP Colorado License Plate style patch. The front is quilted black and the back is cool pink mesh. 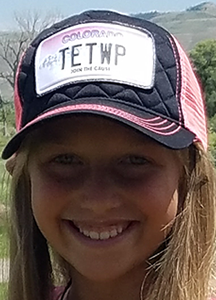 A stylish light gray and black cap with black and pink Cattlemen’s Days TETWP set in a Colorado License Plate patch. Classic. 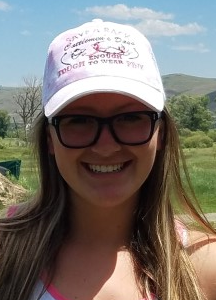 Make a statement with this hot pink and gray Cattlemen’s Days TETWP hat. It is sure to please. Ahh! Enjoy a soft, comfy, put your feet up on the coffee table kind of evening in this pajama top. Pair it with our pajama bottoms for a complete set! You can’t get much toastier than sliding into this pair of plaid flannel TETWP pajama bottoms. Be sure to complete the set with our PJ Top. 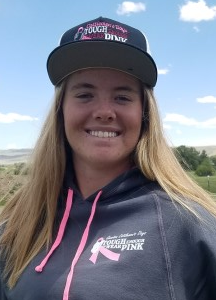 Attract some attention in this women’s cut Tough Enough to Wear Pink Golf Shirt. Short sleeved, collared, hot pink. 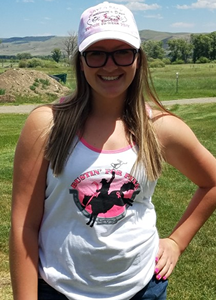 This cute white tank top with pink trim and the “Bustin’ For Pink” logo has a surprise! 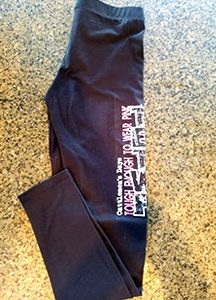 The back is a solid matching pink with the TETWP logo. 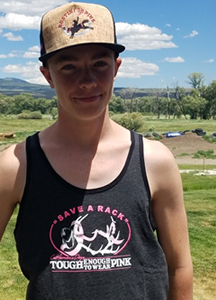 Keep it cool in this terrific dark gray tank top with our “Save A Rack” logo on the front. 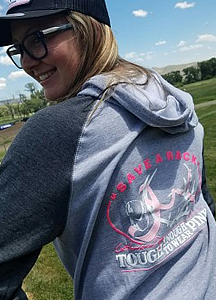 Gray heather tank top sports the “Save A Rack” Logo in pink and white. 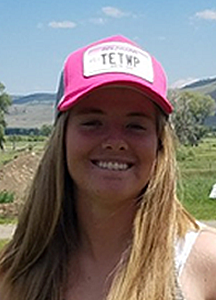 Our Colorado TETWP patch stands out against a black background in this fun hat. 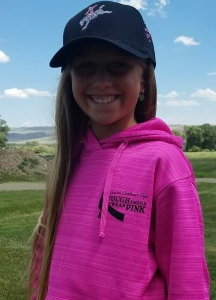 A stylish cap with black in the front and white in the back and the Cattlemen’s Days Tough Enough to Wear Pink logo. Classic. 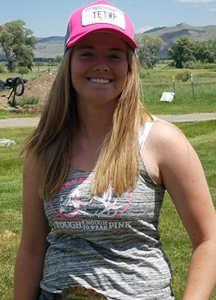 A light pink camo baseball cap with the Cattlemen’s Days Tough Enough to Wear Pink “Save A Rack” logo is sure to please. 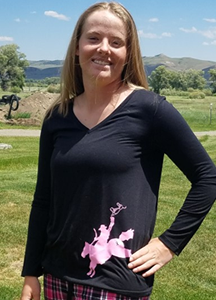 This dreamy hot pink top with hot pink lace inset on the back keeps you cool in style while spreading the word about Cattlemen’s Days Tough Enough to Wear Pink. The classic look, perfect for the office, golf course, or the rodeo. 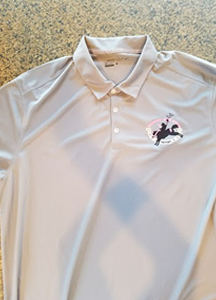 This gray polo shirt sports the Cattlemen’s Days TETWP “Bustin’ For Pink” logo on the front. 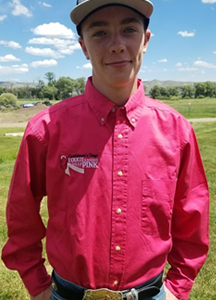 Look sharp in this hot pink button up shirt with the Cattlemen’s Days TETWP logo embroidered on the front. This black long sleeve Henley shirt with buttons and our TETWP logo feels good when the weather is cool. 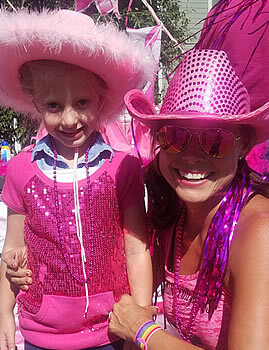 Yes, you are “Tough Enough to Wear Pink”! 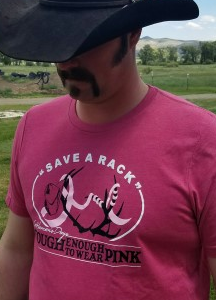 This short sleeve “Save a Rack” tee works for everyone. 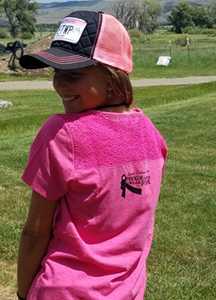 Share the “Bustin’ For Pink” logo on this classic black tee. Lookin’ good in pink and black! 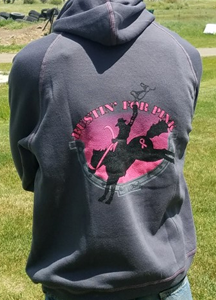 The “Bustin’ For Pink” cowboy shows front and center in pink on this black cap. Turn it to the back and see “Cattlemen’s Days TETWP”. Whoa! 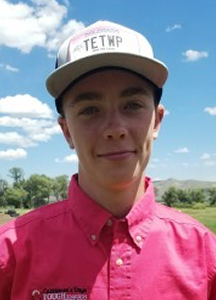 You will get double takes with this “Bustin’ For Pink” hat in black and wood grain style. You can’t beat a tennis visor for comfort. 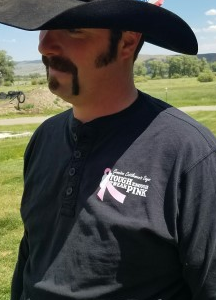 This one comes in white with pink stitching and the Cattlemen’s Days Tough Enough to Wear Pink logo. 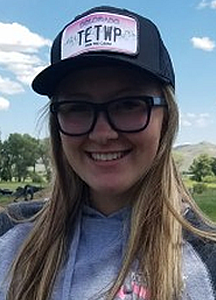 Get a sporty look with this gray quarter zip windbreaker with the Cattlemen’s Days Bustin’ For Pink logo printed on the front. 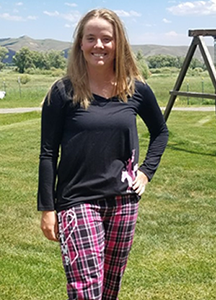 Get comfy in these soft Cattlemen’s Days Tough Enough to Wear Pink tights. Perfect for yoga, hiking, or lounging around. 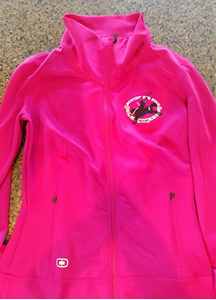 Enjoy the warmth of this hot pink zip up jacket with zippered pockets. 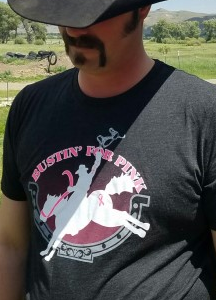 The logo shows you are “Bustin’ For Pink”. 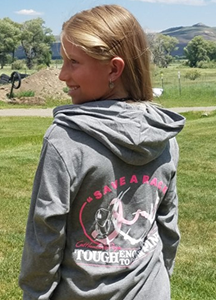 Keep toasty in our dark gray “Bustin’ For Pink” pull-over hoodie. The hood includes a pink lining and pink drawstrings. 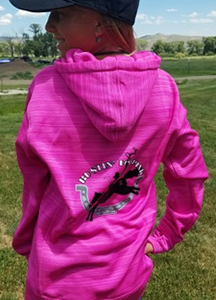 A lightweight full zip pink hoodie with the “Bustin’ For Pink” logo printed in black and white looks cute as a button. Super-cute hot pink heather pull-over sweatshirt. 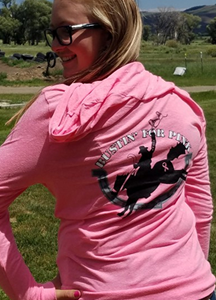 “Bustin’ for Pink” logo printed on the back with Cattlemen’s Days Tough Enough to Wear Pink logo on front. Get comfy in this lightweight gray full-zip sweatshirt. 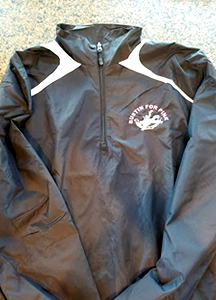 The “Save a Rack” logo is printed on the back with the Cattlemen’s Days TETWP logo on the front. Dark gray sleeves are offset by the lighter gray body of this hoodie. Our “Save A Rack” logo compliments the back. 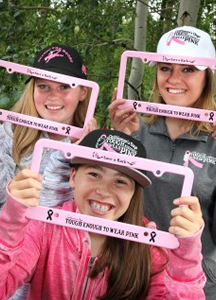 Spread the message and “Save a Rack” with these great pink license plate holders.